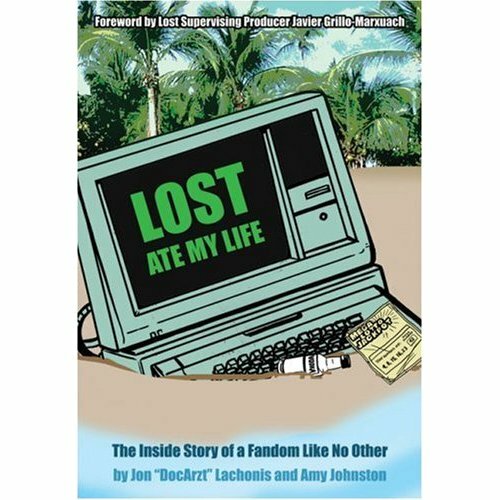 Jon Lachonis and Amy Johnston (aka DocArzt formerly of TheTailSection, and Hijinx from the Fuselage) have published their book on Lost fandom: 'Lost Ate My Life' The book is not a rehash of content from their respective websites, but is a varied new collection of unique content, including past and new interviews with Carlton Cuse, Damon Lindelof, Bryan Burk, Gregg Nations, Javier Grillo-Marxuach (who also wrote the forward), as well as a personal report from the set. Lachonis mentions there are more surprises in store as well. The promotional material explains the title: "'Lost Ate my Life!' is not the authors' self-referential statement. Instead, it is the collective cry of the hardened fan base for ABC's pop-culture phenomenon. The book has two central ideas: first, that the creators of Lost created a shift in the thinking of online communities, effectively removing the barrier between the artists and the patrons... (and) Lost bloggers became important celebrities amongst the fan bases, some fans found themselves drawn into the inner circle..."